Doll Quilt Swap ... recap and new round now open! You may have heard the rumors, but yes ... I am here to tell you that they are all true: signups for Doll Quilt Swap 7 have opened up. 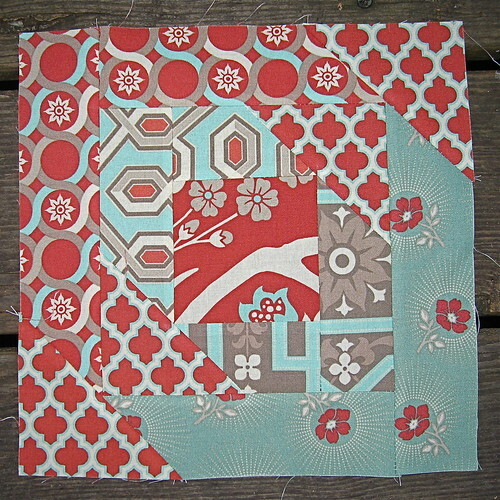 So much for my mini quilt swap hiatus. Anyhoo, the first 200 people to sign up are guaranteed spots ... and they are filling up fast. So what are you waiting for? Go! Go! But be sure to come back, because I thought this was a great time to post the recap of DQS6 that I've been meaning to get to for a few months now. 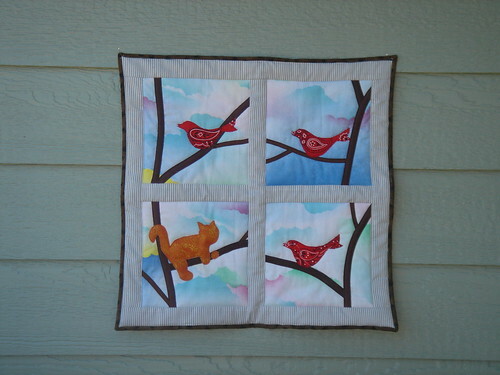 I wanted to honor their talent and hard work by posting this gallery of their quilts. So sit back, relax, and enjoy! 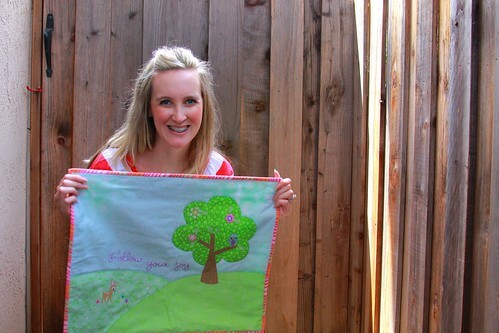 Love that Tula Pink fabric! What a creative idea! Those little pennants are so original. Oh, hey Darci! 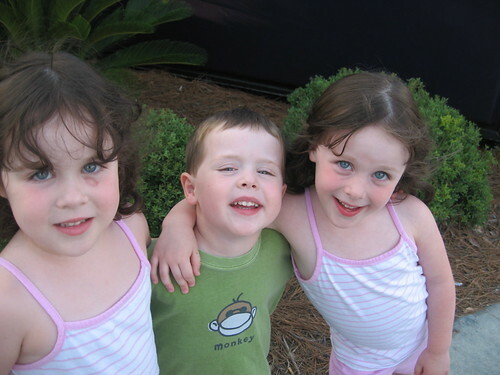 Cute pic. ... which closes out my little circle. Like what you see? 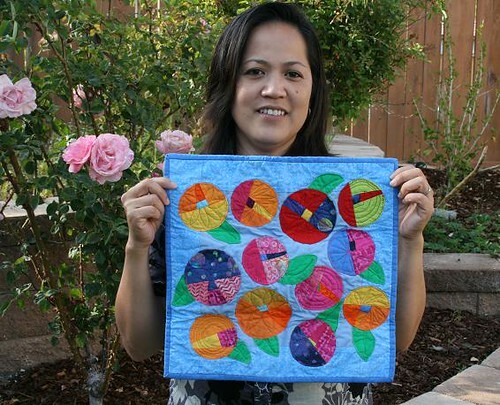 Inspired by the great work of these fabulous quilters? Then head on over to Flickr and get involved. Rules and guidelines can be found in the group. OK, folks ... you heard it here first. 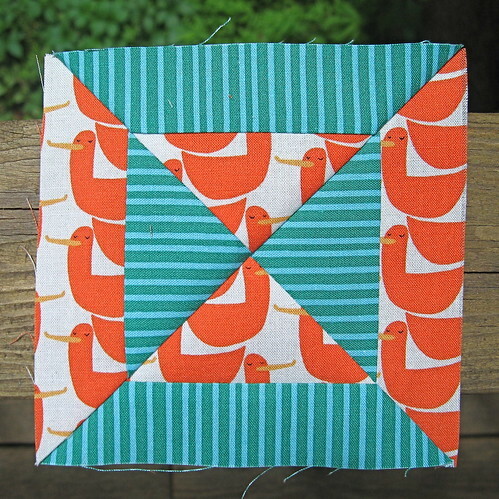 I am officially on a self-imposed mini quilt hiatus. As you all know (and many have commented! 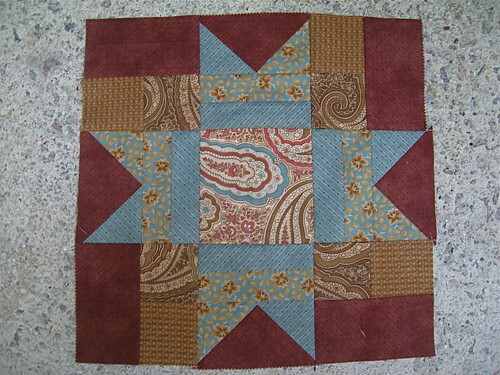 : ), I've been on a bit of a mini quilt bender for the past year or so. I wouldn't have done it any differently -- I really credit all of those swaps with helping me to learn both basic and new techniques, build my confidence (thanks to all of the help and support of fellow swapees), and meet a whole bunch of really, really great people -- but it's time to face facts. I have a whole slew of larger projects in various stages of completion. 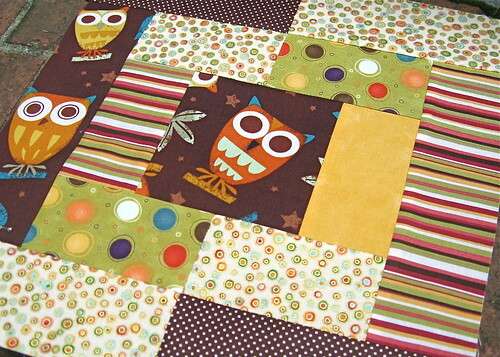 And I've been avoiding basting, quilting, and binding full-sized quilts. I've got to start clearing some of these projects out! I believe I've seen "WIP Wednesday" posts around the blogiverse and thought it would be a great way to track my progress on these projects ... and to keep me honest! 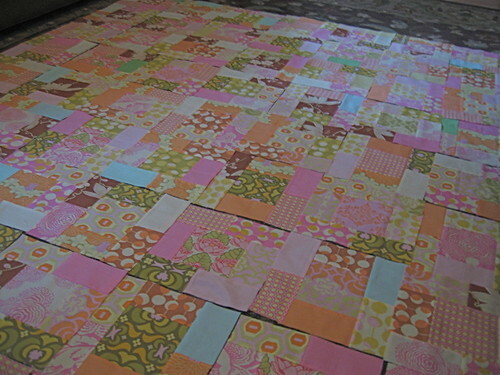 My WIP Wednesday posts will be devoted to my larger quilts only. 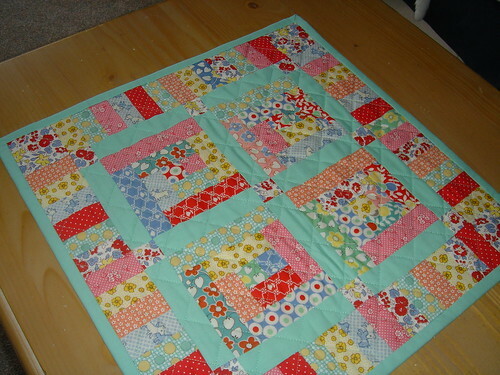 First up, do any of you remember my very first Doll Quilt Swap? 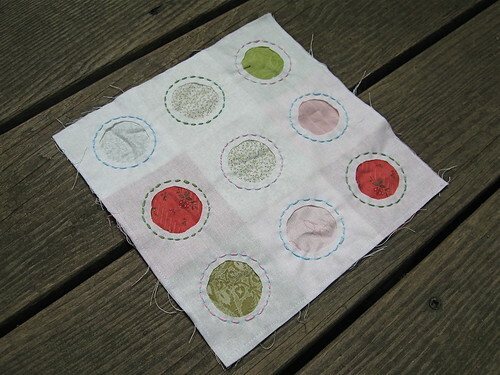 Well, as soon as I finished up that little quilt I decided to use the remainder of my "Wee Play" charm pack to make a larger sized version of it. 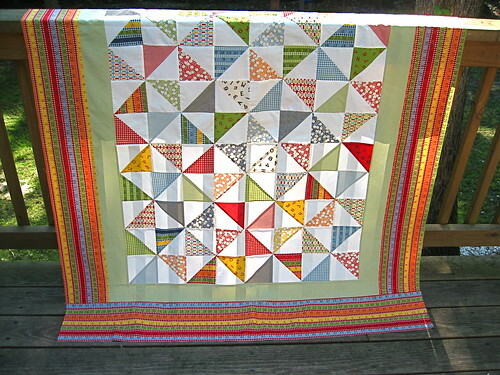 I've had the middle (pinwheel) part of this quilt done for, oh, almost a year now. All I had to do was add the two borders. Why did it take me so long?? In retrospect, I wish I had made the inner border a bit thinner. Another quilt top done. Moved to the "to be quilted" pile. 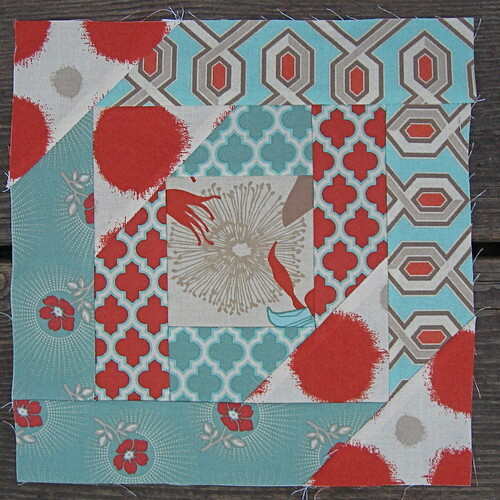 Up next, piecing this Amy Butler "Midwest Modern" quilt. 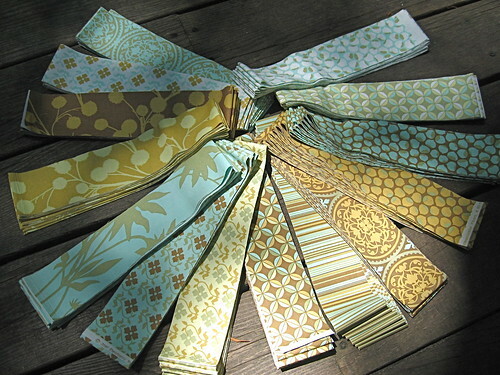 I bought these fabrics and picked the pattern to make as a wedding gift for an MBA classmate's August wedding. Ummm, no ... not next month. August 2008. Yes, last year. Does Miss Manners still give us 12 months to give a wedding gift?? Blocks are done. Layout is final. Now I just have to piece it all together. 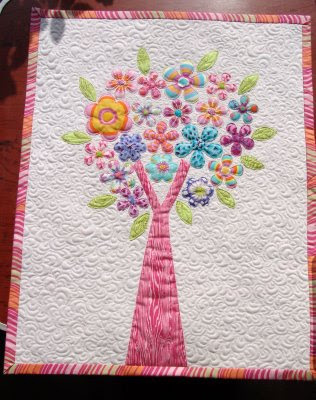 My goal is to have this top pieced by next week's WIP Wednesday. 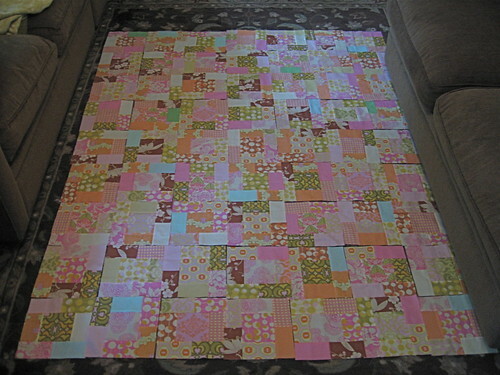 I would say I am about halfway done with piecing the strip sets ... and what I've pieced has already been cut into blocks. 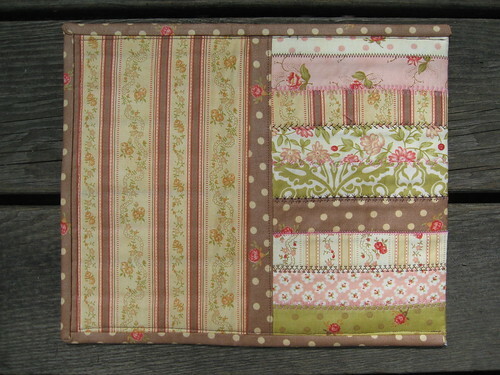 I still have a bunch more strip sets to sew together. Maybe I'll shoot for July 22nd to show this one off? - Remember this? My Full Moon Forest quilt that I made as part of Amanda Jean's quilt-along (embarassingly, I haven't touched this one since October 2008). 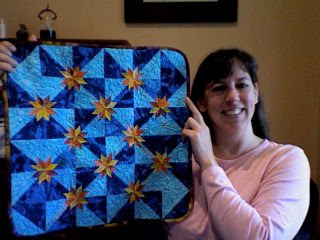 - My Amy Butler quilt with blocks from my Craftster group. 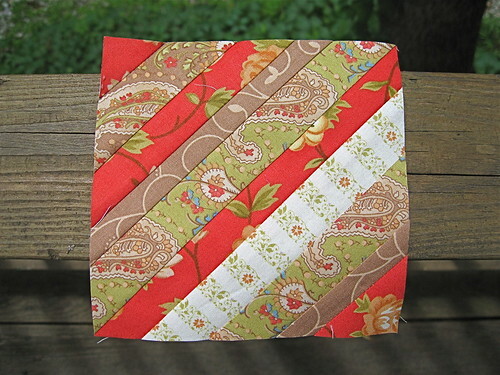 - My SewConnected, Buzz Cuts, and Cottage Quilting Bee quilts ... some straggler blocks are still rolling in. - ... and some others that I can't think of right now. WARNING: marathon post ahead!! Turn back now if you don't have a few minutes to kill! Is it just me, or was June 2009 the fastest month in history?? Wow, it just blew right by me. I only had one blog post in the whole month! Crazy. 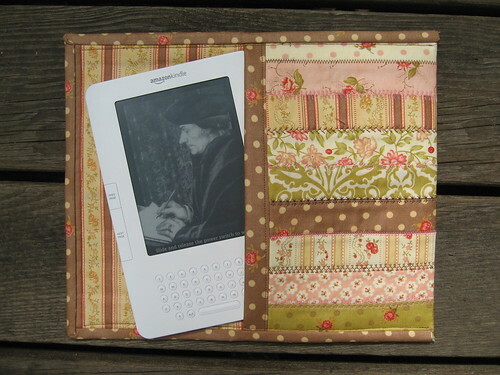 Luckily, I was able to keep up with my many online quilting bees. I am terrified of falling even one month behind, because I know the snowball effect is huge in these things. 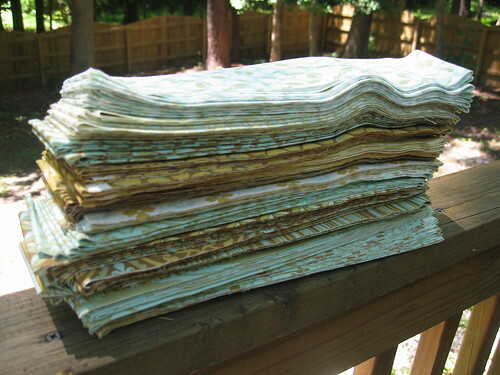 One missed month turns into piles and piles of other people's fabrics that need to be made into blocks. And I definitely take the commitment that I made to other people very seriously. So on to the block-making ... ! For SewConnected, Sarah (aka krommama) sent out ... NOTHING! Her challenge (which is SO TRUE to who she is!) was to make an entire block out of nothing but our own scraps. And those of you familiar with Sarah's work know that she LOVES wonky houses. 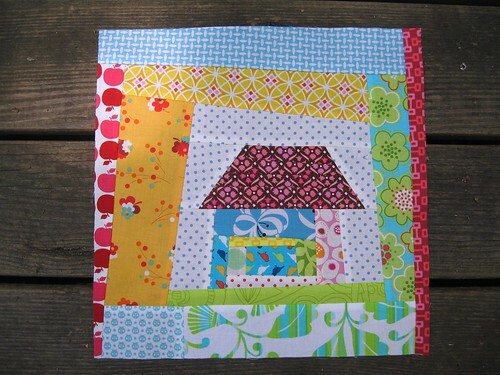 So that's what she asked for: scrappy, wonky houses. Fun! My favorite part about this house is the roof. You can't really tell from the picture, but it's made up of 3 or 4 very skinny strips of the same fabric, all sewn together. 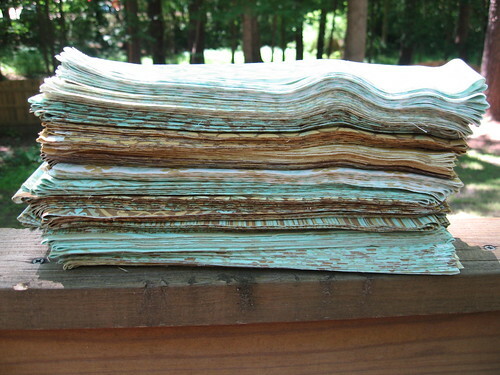 The result is a textured roof ... almost reminiscent of shingles or gables. A small but nice detail, I think! 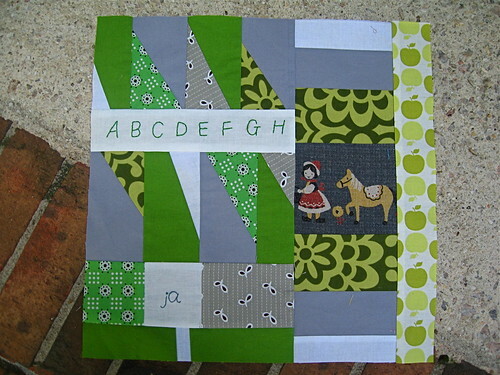 Over at SewConnected 2, Amanda (sasikirana) selected a really striking array of greens and greys for her quilt blocks. Her color combo is so, so great (check out her picture here). She also included a hand embroidered strip of the alphabet for each quilter, as well as a smaller bit featuring the quilter's initials. What a great way to tie all of the blocks together! 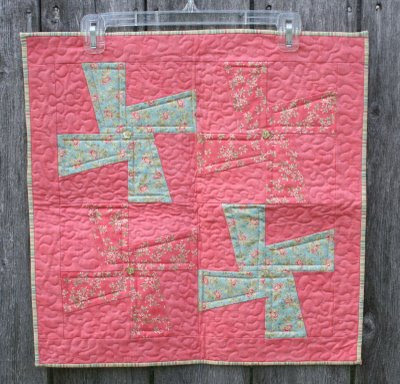 And featuring the "signature" of every quilter on their block is such an inspired idea. Her request was for improv-style blocks. I had no idea where I was going with this until I was done ... and I am pretty happy with the final result! It finished a bit too narrow, so I added the column of green apples down the right side of the block. 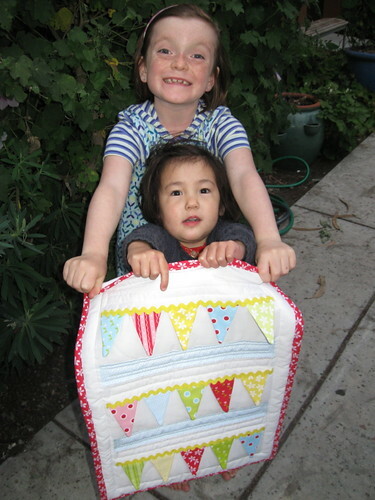 June was a 2-quilter month in the SewConnected 3 group, and to help defray shipping costs for the group, I assigned the month to both of our Belgian members: Dallas (aka forthejourney) and Sarah (aka craftywaffles), affectionately known as "Team Belgium"! 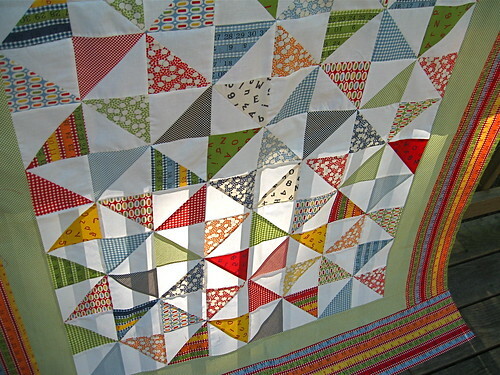 I can't wait to see how Dallas' final quilt turns out! Sarah really decided to throw out a challenge for her blocks. 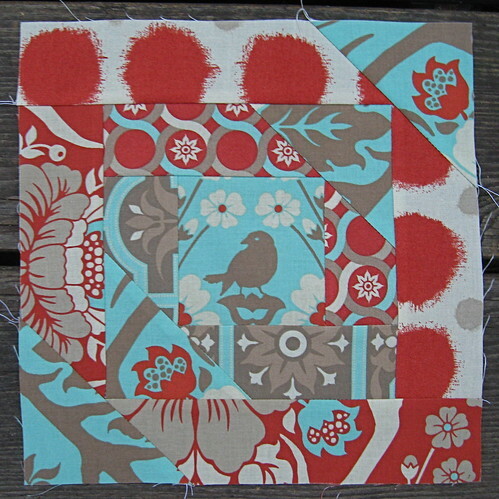 Her vision is for a "modern, shabby chic" quilt inspired by antiques and Cath Kidston. 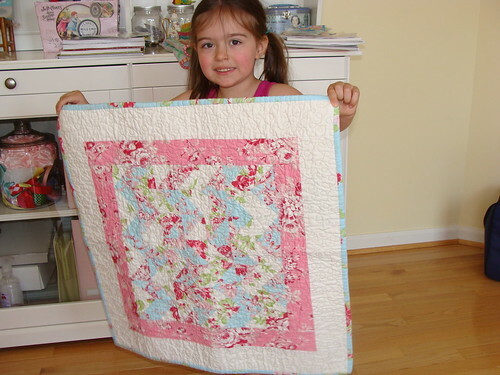 She sent everyone a blank-slate cut of white fabric and a selection of some of her shabby chic prints. Her only direction was "bubbles" ... to be interpreted however we like. Her challenge was to work with curves and circles ... something I really haven't tackled yet. After going back and forth, back and forth a few times on my design, I decided to experiment some more with reverse applique. I figured that it would be different & unique, and the slightly frayed edges that will occur over time (after washing) would be VERY shabby chic! And next, a nice orderly collection of 9 bubbles. I tried to select soft, coordinating perle cotton colors for the stitching. It's still a new technique for me, so I really, really hope that these blocks can stand the test of time! I hope they meet your vision, Sarah! Buzz Cuts is a really fun group to be a part of. Very feisty! Lots of good discussion and banter happening over there. 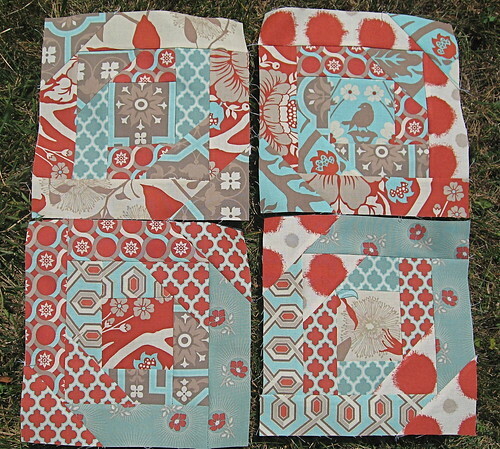 For June, Jean (aka JAmundsen) sent out some swanky Moda fabrics and asked for some "anything goes" blocks in a variety of sizes. Mary (aka namawsbusyquiltn ... I love typing that screen name!) 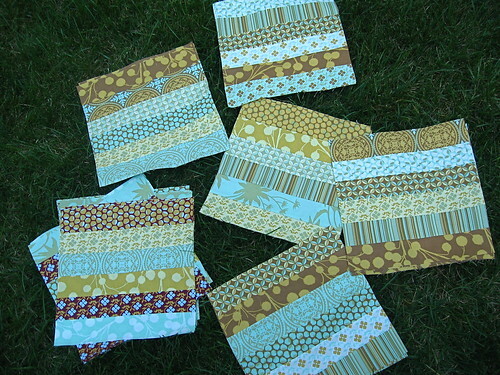 is also a member of Buzz Cuts, and decided to get a jump start on July by sending out her fabrics early. 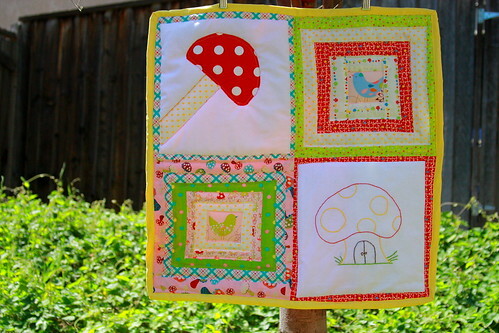 To be perfectly honest, I had forgotten that this was a July block and thought it was due by the end of June! No worry ... it just lightens my load a bit for July. ... and an itty-bitty 6" star. 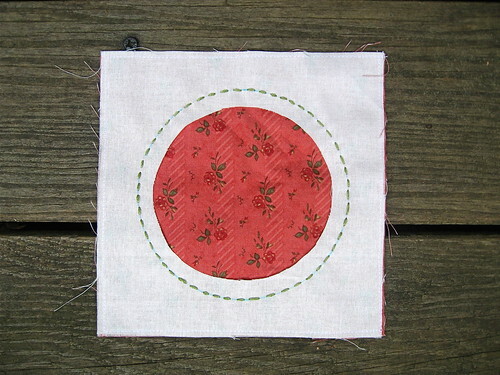 I am definitely not used to sewing with such small pieces and cuts. As you can see, I had a bit of trouble getting all of my mini seams to match up. This picture is an extreme close-up; it looks a lot better from afar! Stars seem to be a theme for several swaps lately. 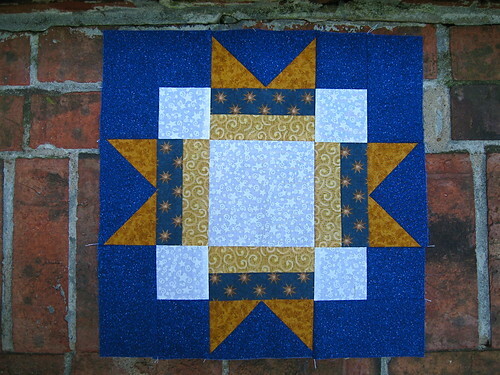 Donna (from bee inspired) also asked for star blocks from the group -- this time, in a standard 12.5" size and made from her selections of blue, white, and gold. 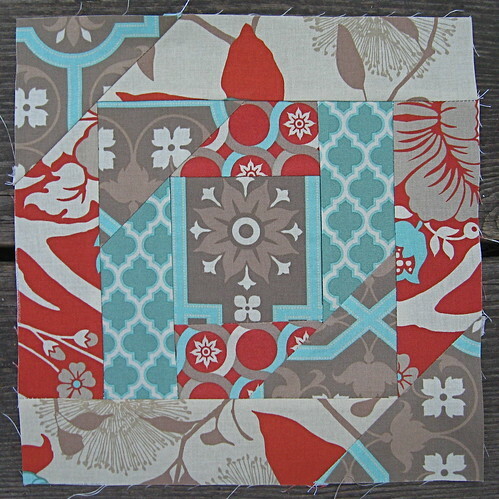 Another great month full of wonderful fabrics and fun challenges! 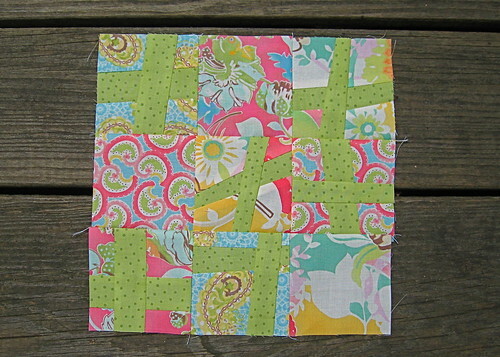 I really love making blocks -- it eliminates the stresses I have about basting, quilting and binding! 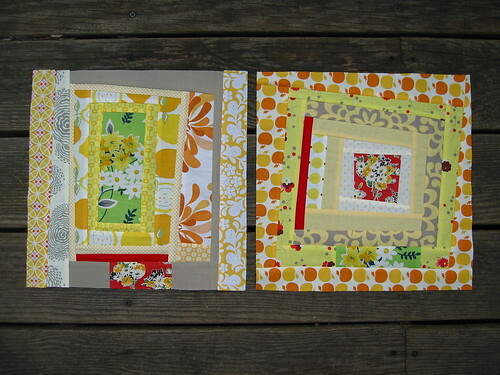 How can I find out about new swaps or quilting bees that might be open to new participants? I can only recommend following the same path that I did -- check out the Flickr groups and watch the discussion threads for open groups. 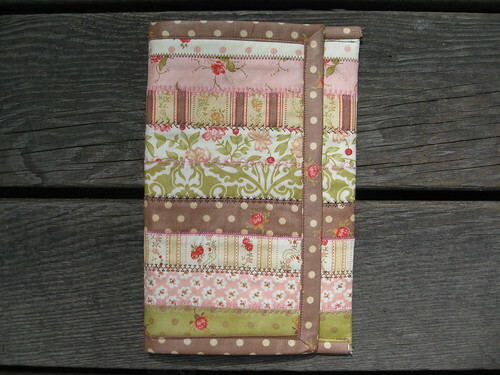 Monthly swaps are a great place to get started -- I recommend the 6-12" Mini Quilt Swap Group, or Swap Til You Drop. Other mini quilt swaps, like the Doll Quilt Swap or the Mini Quilt in a Bag Swap, aren't quite monthly, but are usually open to new swappers. 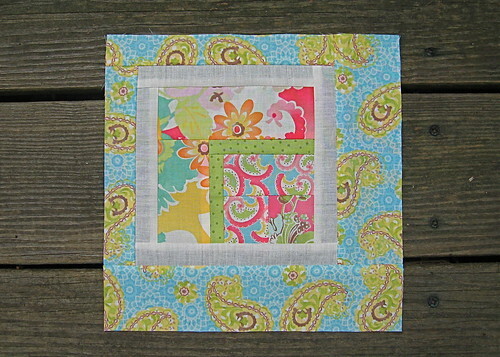 Finally, the best resource for info on quilting bees is Erin's Quilting Bee Blocks group. It has become the go-to place for both people who are recruiting and those looking to be recruited for a bee! And if all else fails, and you're feeling sad that you're not being invited to any groups, do what I did: start your own! That's how SewConnected was born! Is anyone else as addicted to Pandora.com as much as I am? I LOVE it. However, the combination of Pandora + iTunes is EXTREMELY dangerous to my checkbook ... it's way too easy to discover new music and, one click and $1.29 later, it's yours forever. 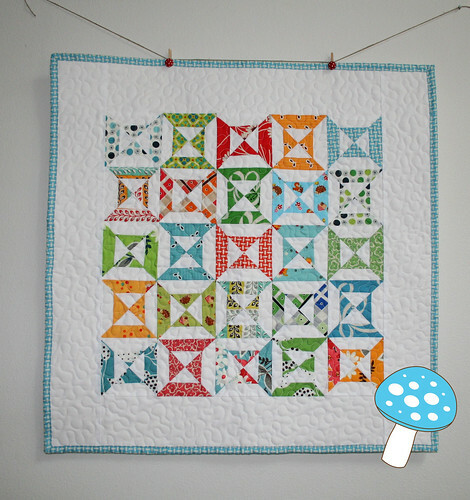 For quilting & sewing, it's usually a toss-up between "Josh Kelley Radio", the very similar "John Mayer Radio", or "Black Eyed Peas Radio". The Peas have been winning more often than not lately. OK, speaking of Material Obsession, I recently got the first book and I dig it. So much so, in fact, that July is my month to send out fabrics for Rachel's bee inspired group and I drew my inspiration from one of the quilts in the book. I always admire pineapple quilt blocks, and "The Big Pineapple" quilt combines this traditional pattern with very modern, contemporary fabrics. It got my mind racing, and I quickly decided that I wanted the group to help me make a modern pineapple quilt. First, I had to decide what fabrics to use. If you've been reading my blog for a while, you know that I am a huge fan of Joel Dewberry's designs and I've been anxiously awaiting his Deer Valley fabric line for quite a while now. It didn't take long to decide that this was the perfect fabric line to fulfill my vision. 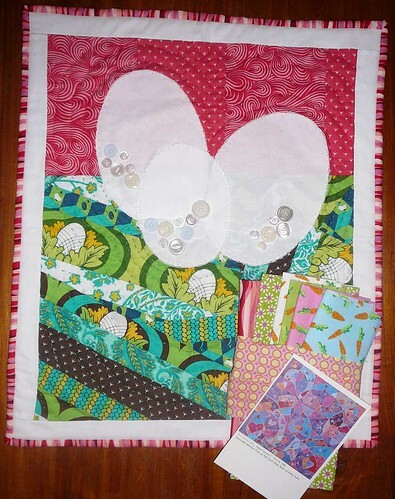 I scoured the 'net for a free pattern that I could include with my fabrics, but could only find paper piecing patterns. And as y'all know, I don't paper piece ... so I'm sure as heck not going to ask 17 other people to do it for me! 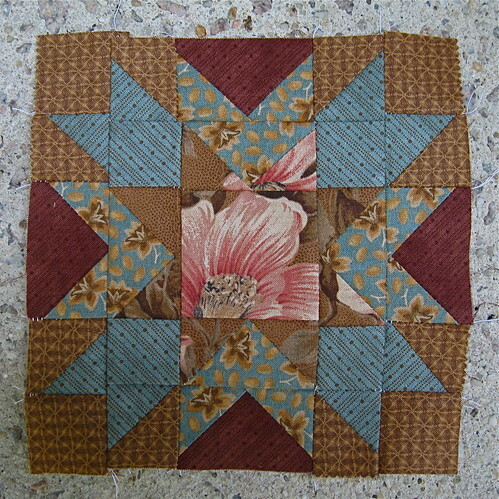 Some more searching and I found the perfect solution: Bonnie's Pineapple Blossom quilt pattern over at Quiltville.com. 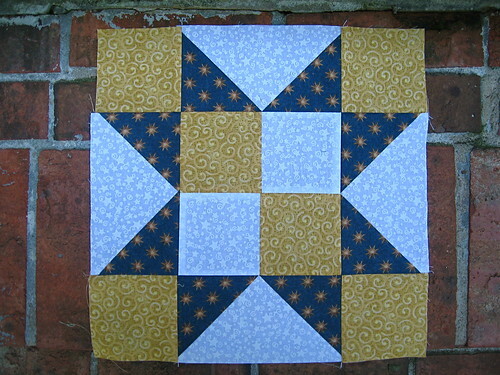 Great pattern, easy enough for the various skill levels in our group and, best of all, all traditional piecing. ... and I am THRILLED with the result! I know that you lose the pattern somewhat with so many different fabrics going on, but I wanted the end result to be scrappy and I think (hope) that the pattern will come through when it's all together. Even if it doesn't, it will still be a kick-a** quilt. Anyone else working with Deer Valley yet? Happy 4th of July (a day late)!! I hope you all had a wonderful weekend, whether you celebrated or not. We laid low this weekend -- had some friends over for a cookout last night, and went over their place for dinner tonight. 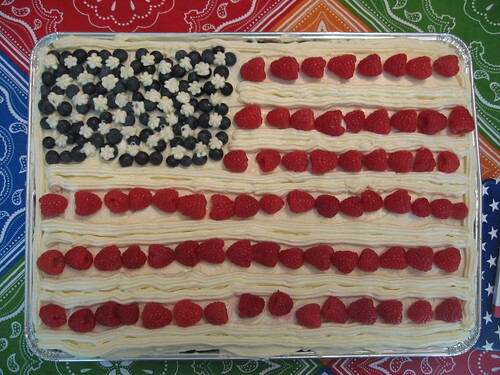 Mrs. Quilt Dad made the cake pictured above in celebration of the holiday ... from scratch! And it was goooooo-ooood. It's a Barefoot Contessa recipe that she got from The Pioneer Woman. She says that Quilt Dad is her favorite blog, but I know I can't even hope to compete with the force of nature that is The Pioneer Woman. 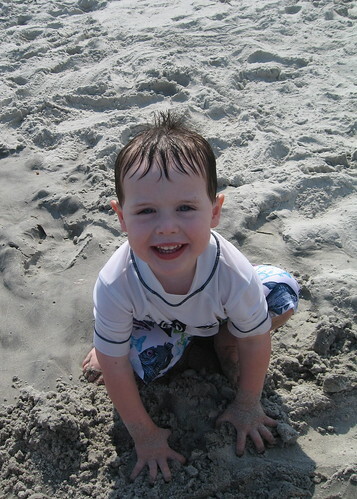 On Thursday, we decided on an impromptu overnight trip to our favorite beach spot in North Carolina, Wrightsville Beach. The kids had a blast ... it's always fun to experience the thrill and novelty of staying in a hotel through the eyes of a child. I also managed to get a bit of sewing done this weekend. I recently bought my wife an Amazon Kindle for her birthday-slash-Mother's Day-slash-anniversary-slash-Christmas (need I go on? It's not cheap!) Of course, I had to make another Bookkeeper from the Moda Bake Shop for her to carry it around in. I love this pattern. Plus, I've got to protect my investment!! 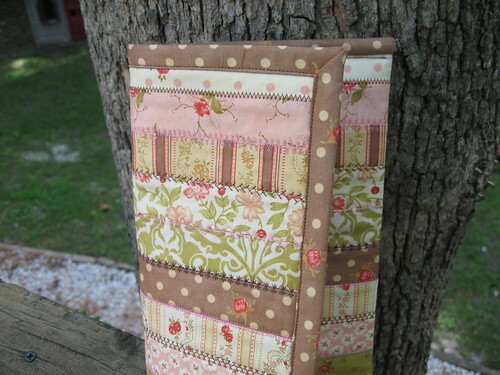 This time I made it using a mini honey bun of "Patisserie" by Fig Tree Quilts. It came out much better than my first two attempts ... and more quickly, too! I showed it to our friends who were over for dinner last night. One of them asked if I would make one for her to gift to her mother, who also just got a Kindle. I had enough Patisserie left to make an identical one to my wife's ... and whipped it up in about an hour last night. I think I've mastered the Bookkeeper! P.S. There is no question that Roger is a true champion, but I was really pulling for Andy today.